Heat oven to 375°F. Grease cookie sheets with shortening or cooking spray. In large bowl, beat granulated sugar, 1/2 cup butter, 1 teaspoon vanilla and the egg with electric mixer on medium speed until well blended. Stir in 1 cup milk (mixture will look curdled). Stir in remaining cookie ingredients. Drop dough by rounded tablespoonfuls 2 inches apart onto cookie sheets. Bake 7 to 9 minutes or until edges appear set. Cool 1 minute; remove cookies to cooling rack. Cool completely. In large bowl, beat all filling ingredients on medium speed about 2 minutes or until light and fluffy. Place flat sides of 2 cookies together with 2 tablespoons filling, sandwich-style. Sprinkle edges of filling with crushed candy. Store in tightly covered container. 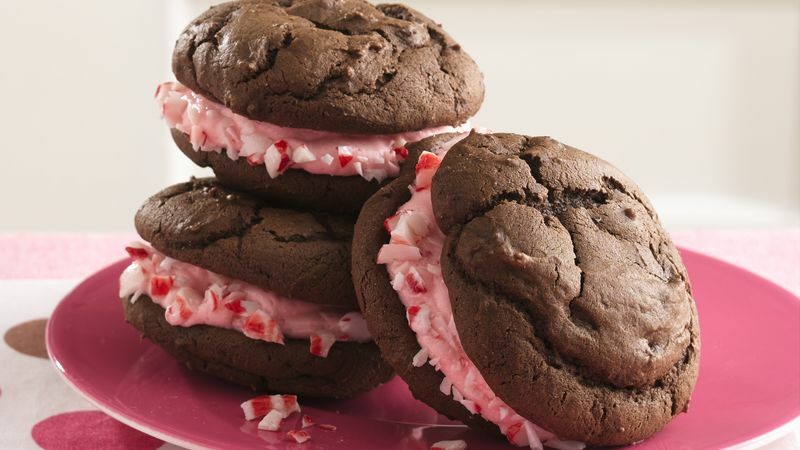 The irrepressible gooey-filled sandwich cookies with the whimsical name, Whoopie Pies are impossible to resist! Freeze sandwich cookies on a cookie sheet, then wrap individually in plastic wrap and toss into a resealable plastic freezer bag--they taste great straight from the freezer!